Design a learning experience outside of a traditional classroom to support youth (8-12) in gaining a deep understanding of their relationships to the environment. Educates kids (8-12) about organic gardening and the health benefits. 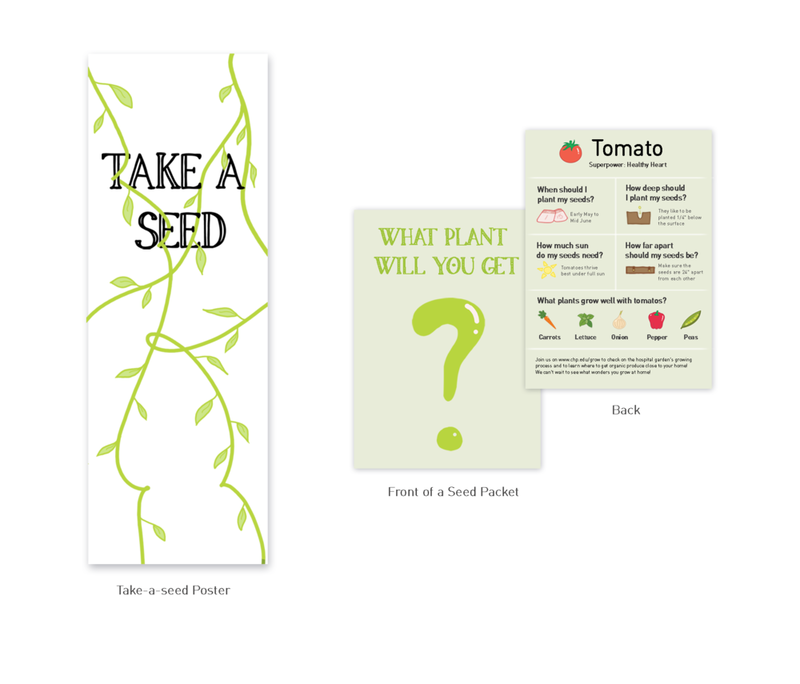 Empowers kids to both grow their own seeds and contribute to healthy food selection at the hospital. How might we design a learning experience for children in the hospital to help them draw a tangible connection between environmental and physical, human health? 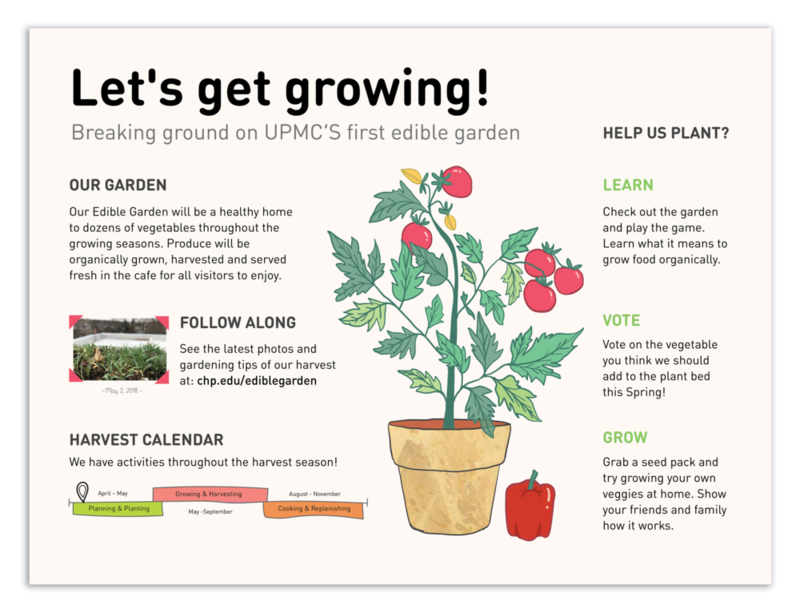 Let’s Grow contains a series of learning activities placed in the cafeteria hallway at UPMC Children hospital and their edible garden. The design artifacts help children draw a concrete connection between what they learn through the hallway activities, the food they eat in the cafeteria and the growing plants in the edible garden. Placed along the hallway, the set of activities give the audience contextual information about the edible garden, educate them about organic gardening and the health benefits, and empower them to use the knowledge they have learned to contribute to healthy food selection at the hospital. The poster serves to introduce the garden to our audience and the reason why the hospital has decided to start an edible garden. It also introduces the phases of harvest, so that our audience can anticipate ways to engage with the garden throughout the year. Children in the hospital couldn't directly involved in the gardening because of the health concerns, but the digital growing game is another way for them to get involved and learn about the growing process of the selected plants, which are also grown in the hospital’s garden. The audience will engage by choosing a vegetable to grow and then getting instant feedback through guided actions. The voting poster empowers the audience to contribute to the future of the hospital, specifically to the health of the people in it. The audience engages by exploring the fun facts about the plants and voting for a plant he/she wishes to be included in the edible garden. The hallway activities end with a fun challenge to grow one’s own plant. It represents the beginning of a new learning experience, where children can personally care for the growth of a seed. The experience also has the potential to generate rich conversations with family and friends. The garden signs located directly in the garden beds. They help the audience draw connections between human health and nature by learning what makes their growth environment organic. We started our design research by interviewing people to investigate how they perceived the connection between human and environmental health. Soon we realized the connection they made was rather limited—most of them mentioned air pollution but not much beyond that. On the other hand, UPMC Children’s hospital has an initiative to bring environmental conscience to the hospital to help improve health outcomes. Seeing it as a great opportunity, we visited the hospital and talked to their staff members. After interviewing the staff from UPMC, we learnt that the hospital was working on an edible garden initiative, but had not thought about involving the children/patients. We thought this was a great opportunity to contextualize the learning experience and provide a tangible engagement. Knowing the opportunity, we started to investigate ways that could help our audience draw tangible connections between food and health. Our audience are kids between 8-12. Based on the information we gathered from the experts at Phipps Conservatory, they are at an age for exploration. It is a time when kids build their independence and make connections between themselves and nature by getting involved. We synthesized what we learnt so far and came up with the following overarching learning goals and the design principles to guide our project. Taking into consideration the insights and principles, we translated our thinking into two conceptual models, which took references from learning theories. Functioning as an experience journey, the model illustrates the sequence, hierarchy, depend, and relationships among all facets. We explored a variety of ideas at the beginning. As we speed dated our ideas, we got vital feedback that allowed us to assess the merits of each idea and use our findings to guide the makings of prototypes. The system we designed was meant to be extendable. We could imagine it being used in a school, particularly an elementary or middle school that is engaged in a gardening program. It could include content around the different phases of the harvest, such as voting for their favorite recipe and dish to appear in the cafeteria. At the same time, the prototype will not function as a one-size-fits all learning tool. Thus, it does include some limitations that are worthy of further consideration. For example, one-time visitors in the hospital may not be able to engage in a rich learning experience if they do not visit the website and follow the growing process virtually. Because there are both long-term and one-time visitors, the variety of interactions is high and it is difficult to design for all visitors. Nevertheless, we believe the learning experience can help kids explore a positive relationship with gardening and growing vegetables, one that has the potential to last a lifetime.